Solving Data Collection Needs The Falcon 345 are the most feature-rich members of the growing family of Falcon industrial handheld data collection terminals from PSC. They were designed for easy integration in the supply chain of companies involved in logistics, manufacturing, warehousing and distribution, and in-store retail. A Favorite Among Users These sleek portable terminals were ergonomically designed with the end-user in mind. They are the lightest weight unit in their class, only 16.3 oz./465 g. Engineered to reduce fatigue, this weight is ideally balanced over the hand using a removeable form-fit rubber-grip handle. 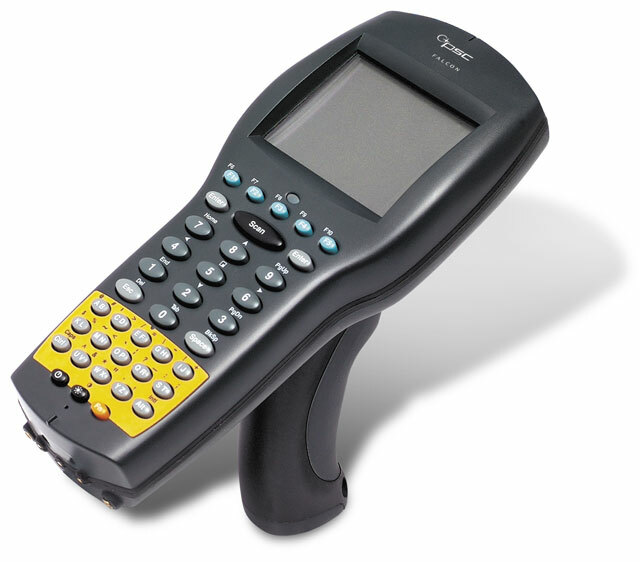 Combine this with an integrated scan trigger, a large 16-line back-lit display, three keypad options and the user enjoys hours of high performance data collection. No Lack of Performance Here At the heart of the Falcon 345 portable data terminals is a powerful 32 bit 486 class processor, running at 33MHz, with 8MB of RAM and 2MB of Flash ROM. This flexible architecture also supports an internal PCMCIA Type II PC card for additional memory or wireless LAN connectivity. Because the Falcon 345 use a standard operating system, DOS 6.22, you can run applications previously developed for other Falcon® terminals and other DOS terminals. Thin client systems can be instantly integrated with terminal emulation and text browser support. You can also use popular PC-based development tools like PSC's Universal Program Generator (UPG) to create custom applications for your data collection needs. Batch and Wireless Models The Falcon 340 with the 486 processor and 8MB of RAM is one of the most powerful batch terminals on the market today. Fast lookup and validation of your data is critical to productivity. The Falcon 345 sets the standard for flexibility when it comes to wireless communications, providing connectivity for data collection applications where real-time information is critical. The Falcon 345 can be configured with any of the leading 2.4GHz spread spectrum wireless LAN solutions including Cisco Aironet and Symbol. Additional flexibility comes when you can have a wireless connection of the Falcon 345 terminals into your existing legacy system. With our PowerNet Twin Client product these Falcon terminals can support VT100, VT220, HP700/92, IBM 3270 and IBM 5250 terminal emulation, with screen formatter capabilities.